MADISON -Wisconsin’s beautiful state parks, bountiful wildlife and hunting opportunities and world-class fisheries are on full display on the Wisconsin Department of Natural Resources new Instagram account. The Instagram account, titled @wi_dnr, gives followers an inside look at what makes Wisconsin one of the premiere outdoor destinations in the country. While many posts will showcase work done by DNR staff in the field, amateur photographers and outdoor enthusiasts of all types are encouraged to submit photos and videos to be shared on the page. 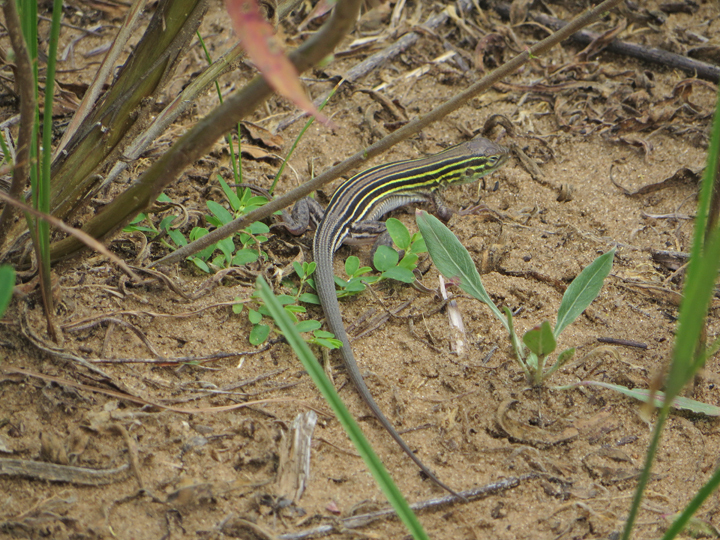 The new DNR Instagram account will feature photos like this six-lined racerunner scurrying around and enjoying life in Wisconsin this summer. The DNR will regularly upload new photos to the Instagram account of people enjoying Wisconsin’s state parks, forests trails and recreation areas as well as hunters and anglers out in the field. You’ll also find photos of the state’s abundant natural resources. People can view the DNR’s Instagram page at www.instagram.com/wi_dnr/ (all social media links exit DNR). For a more interactive experience, the DNR Facebook page, which recently surpassed 100,000 likes, features hunting, fishing and state park posts throughout the week, with an opportunity to interact directly with DNR staff. For people who like to get their news on the go, Twitter provides bite-sized updates for a number of DNR programs and events. Check out the DNR Twitter account. For a closer look at some of the department’s most interesting projects and programs, the DNR YouTube channel provides an inside look at everything from tips for deer season to environmental success stories. The department’s most recent video series, Wild Wisconsin, is uploaded there on the featured playlist. Wild Wisconsin provides deer hunters with all the information they need to know before heading to the woods with an exciting web series and information-packed podcasts. The DNR LinkedIn page allows the department to distribute job openings to over 5,000 followers at a time. If you’re having trouble finding the ideal candidate for a position, try promoting it here. This platform is filled with job seekers looking for exciting and challenging opportunities. Stay connected with the Wisconsin DNR and the outdoors by checking out any and all of the Wisconsin DNR social media platforms. MADISON — Wisconsin efforts to help conserve monarchs are taking off as the iconic butterflies fly to their wintering grounds in Mexico. The Department of Natural Resources recently learned its Natural Heritage Conservation program has won a $69,800 grant from the National Fish and Wildlife Foundation to restore and enhance critical monarch butterfly habitat along the Mississippi River. The grant and matching funds contributed by NHC, county conservation departments and non-profit conservation groups totaling $109,785 will be used to restore and enhance 700 public and private acres at well-known places including Brady’s Bluff Prairie State Natural Area in Perrot State Park and Hogback Prairie State Natural Area in Crawford County. “Monarchs have declined by 90 percent since the 1990s and need whatever help they can get from government agencies, private industries, universities, property owners, and volunteers,” says Drew Feldkirchner, who leads DNR’s Natural Heritage Conservation program. Habitat loss throughout the monarch’s breeding range, which includes Wisconsin, is considered the primary cause of the monarch population’s crash, Feldkirchner says. Managing and restoring monarch and pollinator habitat on tens of thousands of acres, including numerous State Natural Areas. Joining the Monarch Joint Venture, a partnership of more than 50 conservation, education, and research organizations from across the United States working together to conserve the monarch migration. Membership increases funding and networking opportunities. Participating in a partnership with 15 other states to create a regional conservation plan for monarchs. Co-organizing the Wisconsin Monarch Summit in May 2017 with the Wisconsin Wildlife Federation, Pheasants Forever, Natural Resources Foundation of Wisconsin, and Sand County Foundation. This day-long gathering brought together more than 60 stakeholders from government agencies, universities, conservation organizations, and the utility, transportation and agricultural sectors to lay the foundation for a statewide monarch conservation strategy for Wisconsin. Funding four monarch citizen science trainings throughout the state in 2017 with the Natural Resources Foundation of Wisconsin and The Blue Mounds Area Project. Sixty-five volunteers were trained to collect information on monarchs, with more to come in 2018. STURGEON BAY, Wis. – The public will have an opportunity at two upcoming open houses to learn more about the department’s regional master planning process for properties located in the Northern Lake Michigan Coastal Ecological Landscape. The region includes properties in four counties — Door, Oconto, Marinette and Shawano. 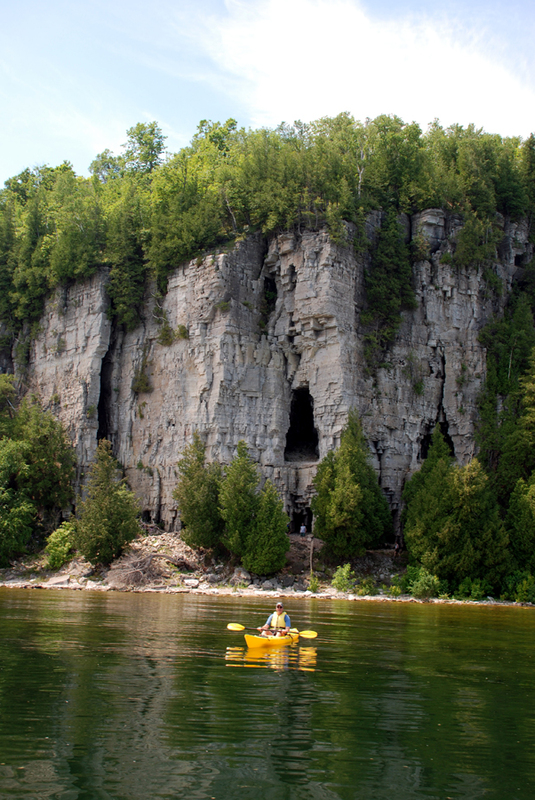 The Niagra escarpment, shown hear along Peninsula State Park, is a dominant feature of the Northern Lake Michigan Coastal landscape. A master plan, guided by Chapter NR 44, Wisconsin Administrative Code, establishes the level and type of resource management and public use permitted on department-managed properties. Under the regional planning process, department staff will develop a plan for all properties located within a defined region. The regions are based on 16 previously defined ecological landscapes in Wisconsin. The Natural Resources Board approved the regional planning process at the June 2017 board meeting. Northern Lake Michigan Coastal region includes approximately 30,000 acres of DNR-managed lands and contains a wide-variety of habitats, key characteristics including the Niagara escarpment, and important natural communities including the Great Lakes beaches and dunes. Located within the region are numerous properties that provide year-round recreation opportunities, including: five popular state parks — Newport, Peninsula, Potawatomi, Rock Island and Whitefish Dunes; prominent State Natural Areas; and popular fisheries and wildlife areas. Tuesday, Nov. 14, Sturgeon Bay: Stone Harbor Resort and Conference Center, 107 North First Ave.
Wednesday, Nov 15, Crivitz: Community Center, 901 Henriette Ave.
“The public is welcome and encouraged to attend the meeting and share their suggestions for future management and use of these properties,” said Diane Brusoe, Property Planning Section Chief. In addition to the meetings, people may submit comments to the DNR by mail or email or through a questionnaire that will be available Nov. 14 to fill out online through the Northern Lake Michigan Coastal region planning page of the DNR website. The public comment period for the first phase of planning is open through Nov. 28, 2017. For additional information regarding this master planning process, contact Ann Freiwald, DNR planner, at 608-266-2130, via email at ann.freiwald@wisconsin.gov, or via US mail at Ann Freiwald, Wisconsin DNR, P.O. Box 7921, Madison, WI, 53707-7921. MADISON — While Wisconsin’s first catch and release record has been established for musky, there’s plenty of time left in 2017 for anglers to better that mark and enjoy some of the best fishing for the famed fighter and Wisconsin’s official state fish. The northern zone musky season runs through Nov. 30 on inland waters north of U.S. Highway 10 excluding Wisconsin-Michigan boundary waters. The southern zone musky season stays open another month beyond that, closing Dec. 31, 2017, on inland waters south of U.S. Highway 10. Jacob Holmstrom claimed the first catch and release musky record in Wisconsin with this catch last June. 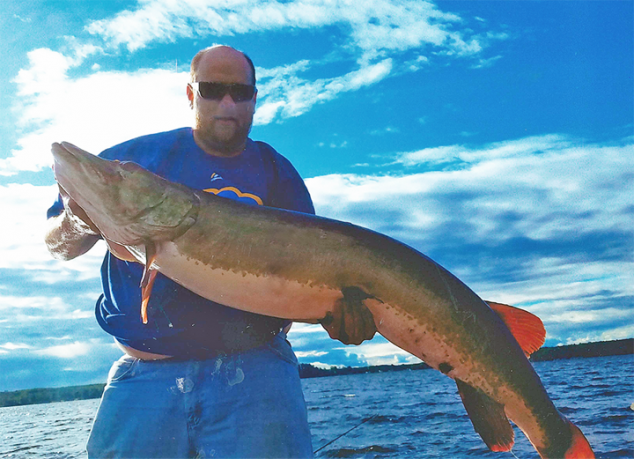 Jacob Holmstrom of Danbury reeled in his place in Wisconsin fishing history by claiming the first catch and release record in Wisconsin for musky. Holmstrom caught the 53-inch musky on Warner Lake in Burnett County on June 24, 2017, around 6:30 p.m. The fish was measured and photographed with Holmstrom before being released. 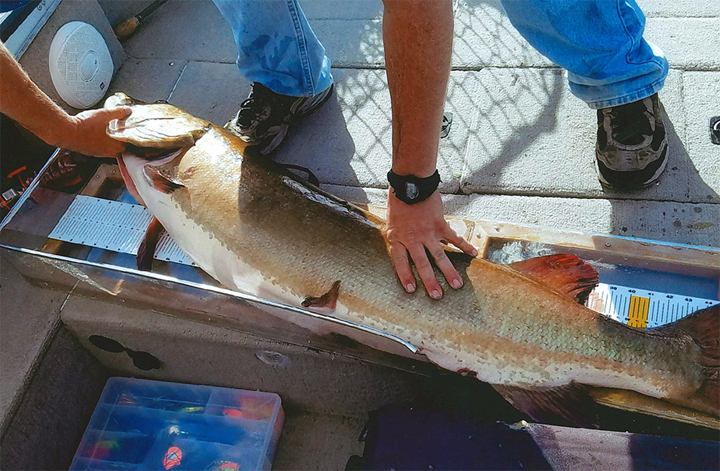 The fish was measured, photographed on its side on a measuring board with Holmstrom, and released, according to Karl Scheidegger, the Department of Natural Resources fisheries biologist coordinating the catch and release records program and the traditional by-weight records program. “We’re excited for Jacob and excited to have our first record established for one of our marquee species,” Scheidegger says. Zachary Lawson, inland fish biologist for Iron and Ashland counties, says recent weather patterns have now ‘flipped’ many lakes, creating conditions where anglers may want to turn attention to deeper rock structure, hard bottom areas, and steep breaking shorelines. “Anglers are taking advantage of prime time for trophy specimens, with muskies up to 50-inches being reported,” he says. 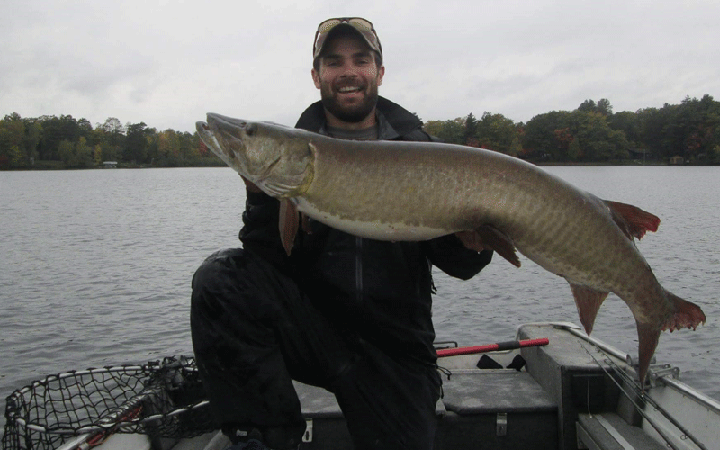 Lawson himself caught and released a heavy 48.5-inch musky earlier this fall. Zach Lawson caught and released this 48.5-inch musky this fall in northern Wisconsin in an area with steep slopes, hard bottom, and adjacent to very deep water. Wisconsin has about 775 lakes and streams with thriving musky populations. The statewide regulation sets a daily bag of one fish with a minimum length of 40 inches but special fishing regulations are in effect on some waters in an effort to bring back the trophy muskellunge Wisconsin is clearly capable of producing. To see fish biologists’ forecasts for musky for 2017 based on fish survey results, read the 2017 Wisconsin Fishing Report. DNR’s live catch and release record program started earlier this year to promote the conservation of fisheries resources and quality fishing by encouraging the careful release of trophy-size popular sport species. Anglers interested in pursuing a record are encouraged to follow these live release tips to minimize stress on the fish as much as possible during the photo process. Keep the fish in the water as much as possible before releasing it. Gently place the fish back in the water. Do not hang the fish on a stringer or hold heavy fish by the jaw as this may damage the jaw and vertebrae. Hold large fish horizontally and support its body. Use wet hands or wet cloth gloves to handle the fish. Have the camera ready before landing the fish to minimize air exposure. If necessary, revive the fish by holding it upright in the water and moving it back and forth, forcing water through its gills. MADISON — Scouting, buying your license, sighting in your rifle – the basics. But, how can you take your hunt to the next level? 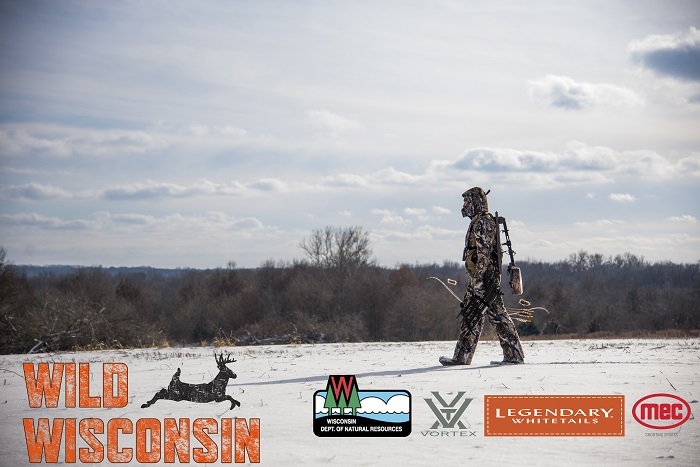 The future of deer hunting is here, with Wild Wisconsin. Sponsors for Wild Wisconsin include Legendary Whitetails, Vortex Optics, and Mayville Engineering Company. Together, we are working to change how we communicate with hunters. Ep. 2: How do DNR conservation wardens work with hunters? Ep. 4: What can active habitat management do for your deer hunt? Ep. 6: Wisconsin, get ready for another great deer hunt! Ep. 8: What do WI DNR staff do to improve your deer hunt? Be sure to follow DNR’s Facebook, Instagram, YouTube and Twitter pages for more Wild Wisconsin as we get closer to the gun deer opener. MADISON — Fall walleye fishing is typically some of the most productive for ole marble eyes, and this year, anglers are getting a bonus bite thanks to a warm fall thus far, state fish biologists say. 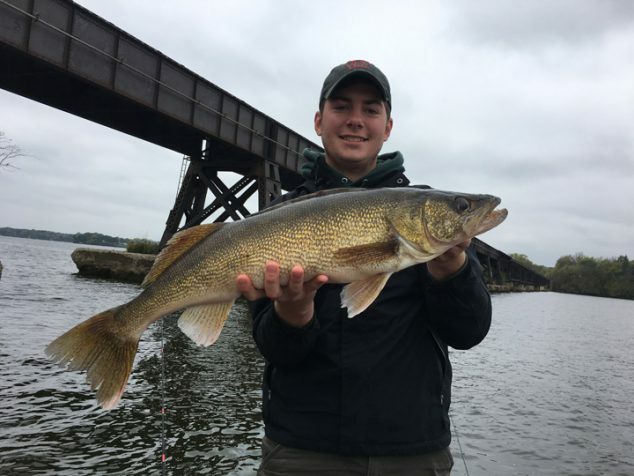 Fall is a good time to fish for walleye, as Alex Bentz shows with 30-inch walleye caught last week on the Wisconsin River. Fish are in shallow water hanging out by the last green weeds, feeding on little perch and bluegill, he says. “Many of the shallower lakes have turned over and the lager deep lakes are close. This will start to get walleye going to deeper water over harder bottoms. Gilbert’s own fishing was good over the weekend and advises anglers to find a walleye lake with a good population, use a quarter-ounce jig and minnow on the bottom or use stick type crank baits in perch patterns for the shallow water bite. Be ready to move and switch up baits and tactics. “The prolonged warm weather in much of Wisconsin delayed the turnover process on many lakes through mid-October, keeping gamefish tight to vegetation and setting up an awesome shallow water bite for walleyes in many of the lakes in our area,” he says. While many anglers were wondering when the transition to the deep water fishing was going to happen, recent weather patterns have now “flipped” many lakes, creating conditions where anglers may want to turn attention to deeper rock structure, hard bottom areas, and steep breaking shorelines, especially in lakes with a cisco forage base, Lawson says. In southern Wisconsin, anglers are catching some nice walleye in shallow water, reports David Rowe, fisheries supervisor in Fitchburg. This time of fall shore anglers can have as good a chance as boat anglers at catching large fish; Rowe recommends fishing shallow water where rivers enter lakes with a slip bobber and a large minnow fished near the bottom. Trolling crankbaits on the outside edge of the weed lines can also be productive for those larger trophies in fall. Wisconsin represents the heart of the national distribution of walleye; they are found naturally in larger lakes and rivers and excellent walleye angling opportunities exist in the Mississippi River; the Wisconsin River and its impoundments; Lake Winnebago; the Wolf and Fox River systems; and larger lakes all over Wisconsin, especially in northern Wisconsin. Anglers looking for new waters to fish for walleye can consult DNR’s “quality walleye fishing waters list” or the walleye forecast in the 2017 Wisconsin Fishing Report. 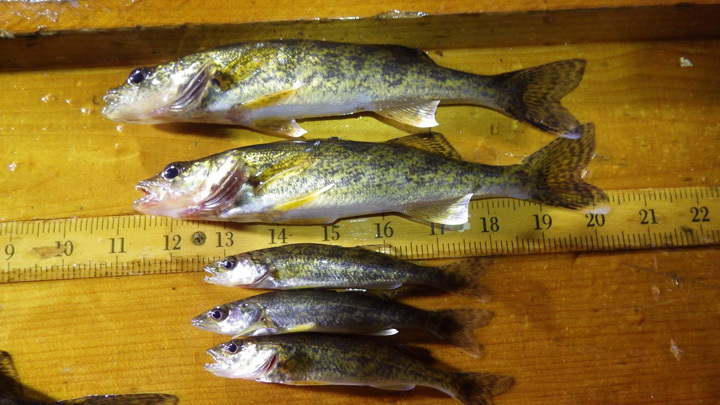 While anglers are busy fishing this fall, state fisheries crews are busy “electrofishing,” using specialized boats to conduct night-time surveys statewide to assess how well young walleye hatched earlier this year have survived until fall. Fall electrofishing efforts in Iron and Ashland County consistently documented a walleye year class (hatched this spring, currently 4 to 8 inches), but also turned up impressive numbers of yearlings in our naturally reproducing waters. Lawson says that electrofishing in Iron and Ashland county consistently documented a walleye-year class but also turned up impressive numbers of yearlings in our natural reproduction systems. “These fish are not quite up to a harvestable size, but anglers are catching good numbers of them now, and this bodes very well for the future of these fisheries,” Lawson says. MADISON — The deadline to purchase licenses for the 2018 Lake Winnebago sturgeon spearing season is Oct. 31, with state biologists forecasting great opportunities to land the fish of a lifetime while enjoying time outdoors with family and friends. “Getting together with family and friends is what keeps people coming back year after to year, but spearers will be happy to know that our 2017 assessments once again show there are a lot of really large fish out there to challenge them,” says Ryan Koenigs, Department of Natural Resources Lake Winnebago sturgeon biologist. The Winnebago System is home to one of the largest populations of lake sturgeon in North America. DNR’s careful management of that population, in conjunction with citizens and conservation groups, allows the continent’s largest recreational harvest through a unique winter spear fishery dating to the 1930s. The 2018 spearing seasons open on February 10, with separate but simultaneous seasons for Lake Winnebago and for the Upriver Lakes. Participation in the Upriver Lakes season is determined by lottery. The seasons run for 16 days or until harvest caps are reached; those harvest caps for 2018 will be set on Oct. 18 when DNR biologists meet with the Winnebago Citizens Sturgeon Advisory Committee, which helps set the harvest caps. 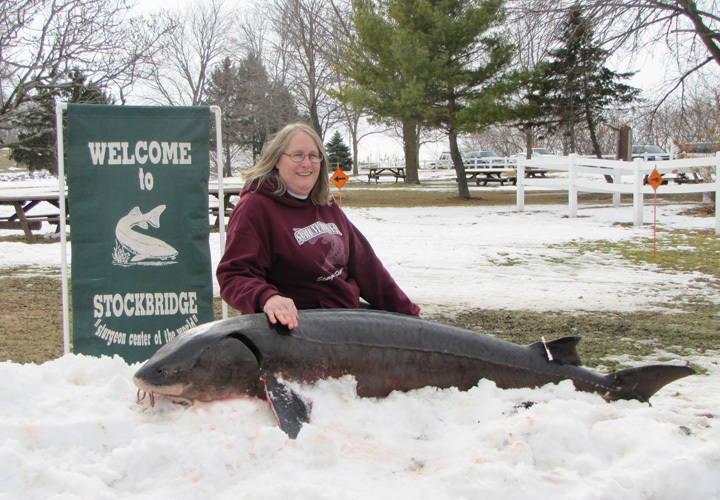 The 2017 season included some impressive fish, including Gerald Peterson’s 83.4-inch, 154.9 pound sturgeon and Sandra Schumacher’s 78.5-inch, 154.7 pound fish. 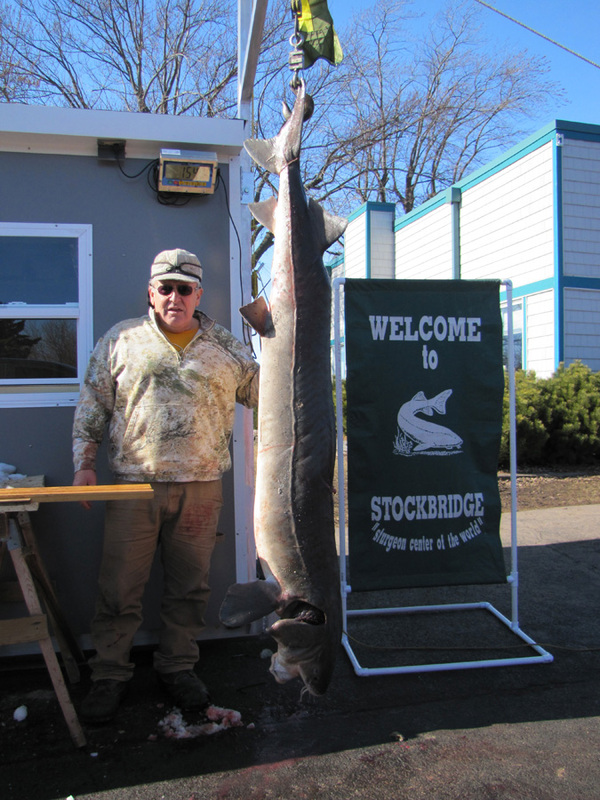 Deteriorating water clarity and ice conditions as the 2017 season wore on combined for a lower total harvest but included some impressive fish, including Gerald Peterson’s 83.4-inch, 154.9 pound sturgeon and Sandra Schumacher’s 78.5-inch, 154.7 pound fish. Thirteen fish weighed in at 130 pounds or larger. A total of 847 fish were harvested during the 2017 seasons, 552 from Lake Winnebago and 295 from the Upriver Lakes. This total is down from averages over the last decade, but still the largest recreational spear harvest for sturgeon in the world and an increase over the 2016 season total of 703 fish, Koenigs says. Again this year, 12-year-olds are eligible to purchase a license and can participate in the lake sturgeon spearing season. Also, adults whose names were drawn in the Upriver Lakes sturgeon spearing lottery can transfer their tags to youth ages 12-17, allowing youngsters a chance to spear on the lakes, where success rates have historically been higher. The minimum spearing age is 12 years, and youth who turn 12 between Nov. 1, 2017, and the last day of the 2018 spearing season can still buy a spearing license after Oct. 31. Military personnel home on leave can also purchase a license after Oct. 31. Spearers are now able to transfer Upriver Lakes spear licenses to youth spearers (age 12-17) and can do so by filling a transfer of license form at least 15 days before the 2018 sturgeon spear fishery. Spearers who applied for an Upriver Lakes license in the lottery but were not authorized received a preference point and can still buy a Lake Winnebago license before Oct. 31. MADISON – The Chiwaukee Prairie Preservation Fund has long played an integral role in preserving the largest remaining prairie and wetland complex in southeastern Wisconsin, helping buy the first 15 acres of Chiwaukee Prairie in the 1960s to controlling garlic mustard and 24 other invasive plants there today. Now that length and depth of service has won the citizen group the Volunteer Steward of the Year Award from the Department of Natural Resources State Natural Areas Program. 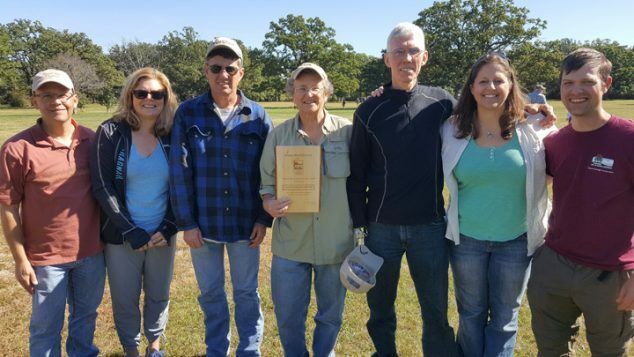 Group members received the award Sept. 30 during a volunteer appreciation picnic at the Mukwonago River State Natural Area in Waukesha County. DNR’s Jared Urban and Sharon Fandel, far right, presented the Volunteer Steward of the Year Award to members of the Chiwaukee Prairie Preservation Fund including, left to right: Chad Heinzelman, Amy Duhling, Alan Eppers, Pam Holy and Nathan Robertson. “Chiwaukee Prairie Preservation Fund and its leadership have been one of our cornerstones in protecting and conserving Chiwaukee Prairie for future generations,” says Jared Urban, who coordinates the State Natural Areas Volunteer Program for the DNR Natural Heritage Conservation Bureau. “Their commitment has only strengthened over the years, and especially so in the last 5-10 years with their increased efforts to recruit more volunteers, to engage more with partners to leverage funding, and becoming active in acquiring land,” adds Sharon Fandel, the DNR Natural Heritage Conservation district ecologist who works with the group. Fifty-two years ago concerned local citizens like Al Krampert and Phil Sander mobilized when the subdivision started to be developed, and in 1965 joined forces with The Nature Conservancy to purchase the first 15 acres of land within Chiwaukee Prairie. Two years later, Chiwaukee would be designated by DNR as a State Natural Area and as a National Natural Landmark by the National Park Service. The Chiwaukee Prairie Preservation Fund was officially incorporated in 1985. Now, the group holds monthly work days. Many of their volunteers are certified to apply herbicides, use chainsaws, and even assist on prescribed burns. Volunteers put in more than 1,000 hours of work in 2016, much of it removing or controlling invasive plants. Key volunteers also work closely with NHC rare plant experts and Plants of Concern, a regional rare plant monitoring program of the Chicago Botanic Garden, to identify which species of rare plants need to be monitored and submit their data to the DNR Natural Heritage Conservation program. More recently, starting in late 2016, the group has been working directly to acquire additional vacant parcels. State Natural Areas protect outstanding examples of Wisconsin’s native landscape of natural communities, significant geological formations and archeological sites. They also provide some of the last refuges for rare plants and animals. WILD ROSE, Wis. — Efforts to establish a self-sustaining population of spotted musky in Wisconsin’s Lake Michigan waters got a boost this fall when 7,000 musky fingerling averaging 17 inches were stocked into the Fox River, several Green Bay tributaries, Lake Winnebago and three inland lakes. The fingerlings were raised for a year in cool water ponds at Wild Rose State Fish Hatchery. They now weigh about a pound and average 17 inches in length, although some were pushing 19 and 20 inches. Department of Natural Resources fish crew members stocked roughly 1,350 fish into the future broodstock lakes of Anderson and Archibald Lakes in Oconto County and Elkhart lake in Sheboygan County, according to Jesse Landwehr, hatchery supervisor. The three inland lakes will serve as the source of brood stock in future years. Beginning in 2019, DNR tentatively will spawn spotted muskies in an effort to ramp up production in the hatcheries. Historically, spotted musky were native to Lake Michigan and its tributaries in Wisconsin but habitat destruction, pollution and over-exploitation during the early to mid-1900s decimated their populations. DNR in cooperation with several local musky clubs and the Musky Clubs Alliance of Wisconsin started to reintroduce the Great Lakes strain musky into Green Bay waters of Lake Michigan in 1989. They stocked fish that were hatched from eggs collected from Michigan waters where spotted musky still are found, and raised them at Wild Rose State Fish Hatchery. Those stockings have helped create a popular fishery in Green Bay with anglers reeling in many 50-plus-inch fish but the ultimate goal of the project–creating a self-sustaining population–has been elusive. DNR staff have worked in recent years to diversify the genetic pool in hopes of seeing better natural reproduction. Michigan had been providing 5- to 6-inch fingerlings to Wisconsin hatched from disinfected eggs and Wisconsin has been sending northern Wisconsin musky fingerlings to Michigan in return. Creating broodstock lakes will enable Wisconsin to spawn its own fish. All the fish going into the three brood lakes were fin-clipped and PIT tagged so DNR can identify individual fish and their parentage. “This enables us when we are spawning on the brood stock lakes in the future to maintain genetic diversity,” Landwehr says. For the rest of the fish going into the Green Bay system, 20 percent were tagged and clipped to help local biologists identify individual fish and assess their growth rates. The Recreation Opportunities Analysis is examining existing outdoor-based recreation opportunities and future recreation opportunities in eight regions throughout Wisconsin. The initial drafts identify recreation opportunities in the Great Northwest (Douglas, Bayfield, Ashland, Burnett, Washburn, Sawyer, Polk, Barron and Rusk counties) and Upper Lake Michigan Coastal Regions (Marinette, Oconto, Manitowoc, Brown, Kewaunee and Door counties) and the potential role of DNR-managed properties in helping to meet these opportunities. In August, the department held open house meetings asking for public input about these regions. Feedback was also received through an online public input opportunity that was open in August and early September. Using this input, the department developed a draft chapter for each region describing future needs unique to each part of the state and the potential role DNR-managed properties play in helping to meet those needs. Wednesday Oct. 18, Rice Lake – City of Rice Lake Building, 30 East Eau Claire St. The public is invited to participate in this analysis by providing information through the online input opportunities found by searching the DNR website for keyword “ROA.” The public can provide feedback online or print out the questionnaire and send completed forms to the department. Public input opportunities for these three regions are open through Nov. 17. Oct. 24, Stevens Point – Holiday Inn, 1001 Amber Ave. While the ROA process is underway in these counties, additional public meetings in other regions will be held as the process moves forward. The analysis process will generally describe recreation opportunities for each region.